This species is from the Sierra Madre, in Mexico. It has very unusual stems which are four sided but have ridges on the edges making it very distinctive although this type of stem occurs in a couple of other unusual salvias. It flowers in autumn so if you are in a very frosty area either grow it with protection or put up with it only flowering for six weeks or so. 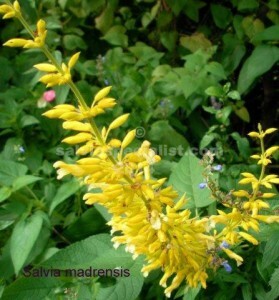 Madrensis has beautiful egg yellow flowers and the calyces are the same colour which extends the colour so much longer. There not being a lot of flowers in autumn/winter it is valued for its remarkable show. Madrensis tends to spread from underground shoots but can easily be removed if it outgrows its area. In sub tropical and tropical areas it possibly needs two prunings to the ground in summer. If you are not sure only do half the plant, learn from the results and prune it the way you preferred the next year. Madrensis probably needs sub tropical conditions to set seed. It is easy enough to grow from suckers. Cuttings need to be from younger wood.